Home » Uncategories » Olympics opening ceremony. Normalising paedophilia. Olympics opening ceremony. Normalising paedophilia. The Olympic Opening Ceremony had GOSH in it with a picture of a kid crying. Great. 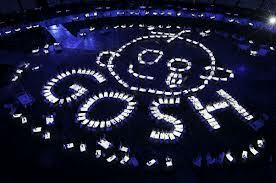 GOSH stands for Great Ormond St Hospital. SH is Sandy Hook. Hurricane Sandy is also SH but reversed. Stoke Mandeville Hospital also appears at the Olympics as the mascot Mandeville. How come? Did they plan the Savile scandal? 0 Response to "Olympics opening ceremony. Normalising paedophilia."